You may remember a recent post I had written about Lucia starting nursery school in September – if not you can read it here. This post however is very different as a lot of my worries and fears are currently being addressed by Lucia’s wonderful nursery teacher-to-be. After a quick chat with Mrs Marks at the open evening last month we arranged a family meeting with her which took place a few weeks ago. 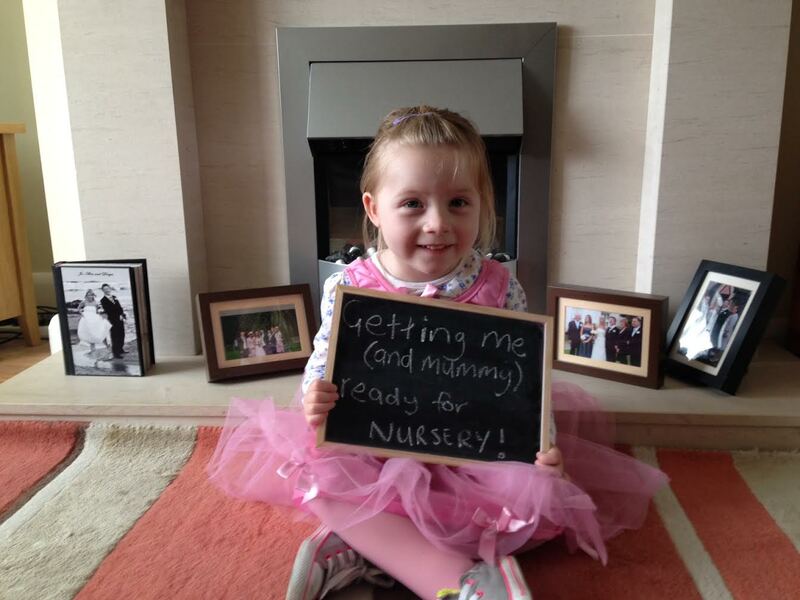 We already know her from Max’s time at nursery two years ago so having that familiarity really helped to begin with. We met in the nursery unit which Max was particularly happy about as he couldn’t wait to get stuck into all the toys that he loved from his time there! Meanwhile, Lucia took her time exploring her surroundings which gave Mrs Marks, Daryn and I plenty of time to chat. However, Mrs Marks is the type of teacher who goes above and beyond all expectation and had already done some research on the condition giving her a good understanding of it. I can’t tell you how much we appreciated this as it can be quite a complex condition to begin to explain. So we spent an hour going through the information, asking and answering questions and allowing me to get all my crazy worries off my chest! We also discussed practicalities like uniform which she is happy for us to adapt to suit Lucia – the children wear ‘cuffed’ tracksuit bottoms so we are looking into leggings or a skirt as an alternative and she will be able to wear her Converse instead of the stipulated Velcro trainers. It was only when I got home that I then realised just how anxious I had been about that meeting as all of a sudden I genuinely felt like a huge weight had been lifted from my shoulders. As I said, Mrs Marks goes way, way above and beyond her call of duty. She got in touch last weekend asking if we could visit nursery a few more times before the end of term to give her some practice and confidence in pulling Lucia’s garments up. This was such a good idea as they are really tough until you get used to them. Plus, it would also help build up her relationship with Lucia ensuring that our little lady was happy for her to do it. And there’s more…she also bought strong patches to iron onto the knees inside a pair of trousers that Lucia can wear for outside play – to save both skin and garments in the event of a fall. A-maz-ing. So we headed back to nursery last week and spent another lovely hour where the children made cards, painted pictures and played. Lucia was so much more relaxed on this second visit and chatted away to Mrs Marks before allowing her to pull up her tights when they slipped down, which was a big thing for her, for me and the teacher! Mrs Marks was surprised at just how tight the garments were and worried about nipping Lucia’s skin when trying to grip them, which is exactly how I felt in the beginning. However, practice builds confidence and when she is doing it several times a day come September it will soon become second nature to her. My two top tips are get a good grip and give a good tug! We are due back in another two weeks for a final visit (the kids are already excited!) before the summer holidays for some more pulling up practice and to also let Mrs Marks take off Lucia’s garments and put them on again, just in case the need arises. There may be some sweat involved but I have no doubt she will manage just fine! The time and thought that this lovely teacher has put into our little girl’s welfare is heartwarming and has settled my nerves so much. I cannot thank her enough already and nursery hasn’t even started yet. I always knew starting school would be a huge thing for us – just like that first trip to the beach, the first time she got her compression, the first toe infection, the first holiday…these are all huge milestones to reach, to surpass and to learn from. But thanks to Mrs Marks I know that Lucia (and I!) will be ok. I have no doubt I will still cry buckets when September comes, but they will be mostly tears of a baby growing up and not so much tears of worry. This week brought some lovely surprises – four if I am exact! 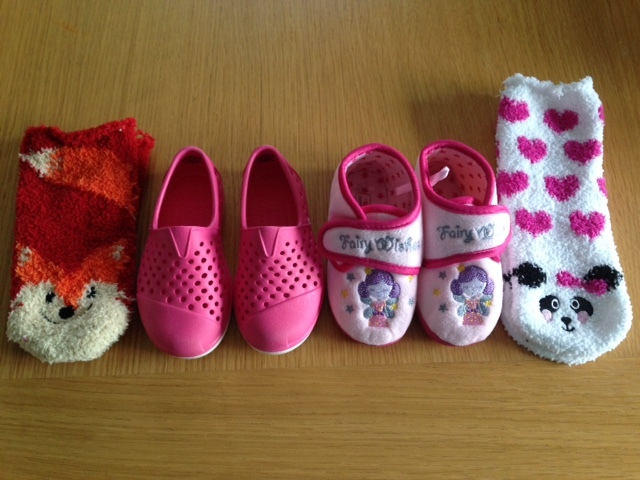 One pair of shoes, one pair of slippers and two pairs of socks, all for Lucia. This is unheard of and the beauty of it is we weren’t even really looking – but my mum was. I have detailed in previous posts how frustrating and upsetting it can be trying to get Lucia footwear, so to have managed to find these four pairs of shoes and socks with relative ease has been wonderful. Last weekend my mum and sister were out shopping and spotted the most adorable pink ‘TOMS Rompers’. They text me pictures showing how soft, flexible and deep they were so I said buy them! And when Lucia opened the little shoe box she couldn’t wait to try them on! Her left foot slipped in no problem and with a little pushing her right foot went in too – it felt like our very own Cinderella moment! She then spent the next half an hour running laps of the house in her new shoes feeling very proud of herself. They aren’t shoes to be worn all day, everyday, but they are perfect for warmer weather and particularly for when we head off to France in the Summer. They are soft, lightweight, covered in little breathable holes and fully enclose her feet providing a little compression. But they are also very protective at the same time. They will be ideal on sunny days when she still has to wear her garments but will hopefully help her feet feel a little cooler. When we took them off they had left the ‘holey’ imprint of the design on her right foot, but as she will only be wearing them for short periods it shouldn’t have any detrimental effect. Mum bought them in a shop here called Clockwork Orange but if you look up TOMS online you will be able to find them. While we were there we also decided to have a look for bed socks as Lucia’s little feet have been freezing in the mornings when she comes in for a cuddle. Obviously she never wears socks during the day as she is always in her compression, but even in the pre-compression days socks were a total nightmare as we could never find a pair that didn’t leave big dents around her legs. But Primark came up trumps again and we found two pairs of soft bed socks with loose(ish) elastic at the top. I bought them, came home and snipped the elastic so they don’t do her any damage and she is currently sleeping sound in her cosy new socks. It is amazing how the little things that are usually taken for granted can bring so much joy when they aren’t so straight forward. When we find shoes for Lucia it really does feel extra special – but best of all is seeing her delighted little face when she tries them on and they fit.